CAMP LUKBAN, Catbalogan City – Soldiers assigned with 78th Infantry (Warrior) Battalion clashed against more or less 10 communist terrorists this morning at Zone 5, Barangay Talisayan, Albuera, Leyte. The troops conducted security patrol and confirmed the residents’ reports about the presence of communist terrorists who were extorting food and money. The firefight lasted for 15 minutes and resulted to the recovery of two Cal .45 pistols; four magazines of Cal .45 pistol; one hand grenade; more or less fifty live ammunition; five cellular phones; subversive documents with high intelligence value; and personal belongings. There are no reported casualties on the government troops while undetermined on the enemy side. The successful operation of the Army is the result of the shared cooperation of the villagers in the said barangay about the presence of the NPA rebels that continue to engage in acts of violence and hostilities endangering the lives and properties of innocent people. The 8ID under the leadership of Maj. Gen. Raul M Farnacio will remain committed to serve and protect the people in Eastern Visayas especially in the far-flung conflict affected areas and a partner for peace and development. He congratulated the troops of 78IB for a job well-done. The 78IB is the newly pronounced “Best Infantry Battalion” in Visayas for the year 2017 of the Central Command, Armed Forces of the Philippines last November 14, 2017. Five days earlier on November 23, 2017, President Rodrigo Roa Duterte declared the termination of peace negotiations with the National Democratic Front - Communist Party of the Philippines - The New People’s Army and all its adjuncts and organizational units through Proclamation No. 360 due to the latter’s continued attacks against government troops and atrocities to civilians. QUEZON CITY – The Center for Energy, Ecology, and Development (CEED), an independent, think-do institution engaged in issues of energy, environment, and development in the Philippines, expressed opposition to the convening of a global clean coal alliance – a proposal made by the US Delegation to the Conference of Parties (COP23). The myth of “clean coal” is premised on the development of technologies that would supposedly reduce harmful emissions and their escape into the atmosphere. One of these technologies is the Carbon Capture and Storage (CCS), which aims to capture carbon dioxide emissions and subsequently store them in underground saline aquifers or depleted oil and gas fields. However, these technologies come at exorbitant costs, and with a dismal track record. “According to the Global CCS Institute, it is estimated that $100 billion annually will be spent to develop CCS technologies. Retrofitting these to older coal plants would most likely cost even more,” claims CEED Legal Officer Avril De Torres. “The recent suspension of operations of the Kemper County plant in Mississipi shows that “clean coal” technologies are decades far from being fully developed and widely deployed. The Kemper County plant was envisioned to be a flagship, cutting-edge project that would pioneer coal gasification and CCS technologies. And yet, after years of delay and billions spent over its projected budget, Kemper County plant’s operations lasted for only 200 days. Operations were abruptly suspended due to issues with its “clean coal” technologies,” added De Torres. Additionally, a recent research conducted by the Institute for Energy Economics and Financial Analysis and the Institute for Climate and Sustainable Cities predicts the imminent stranding of all existing and future coal plants in the Philippines. The stranding of coal plants will inevitably include “clean coal” technologies with it. In the context of the urgent global climate action ushered in by the Paris Agreement, and the continuous drastic decrease in the cost of renewable energy, any talks of forming a global clean coal alliance is misplaced and illogical. A new research from Morgan Stanley already states that numerous key markets have reached an inflection point, where renewables will become the cheapest form of energy in less than three years. According to De Torres, the Philippines is already experiencing a drastic drop in the cost of renewables. “Just two months ago, a solar company entered into a power supply agreement with Meralco, the biggest distribution utility company in the country, at P2.99 kWh. This is a rate that is much lower than the average coal electricity production price of coal plants in the pipeline at P3.66 kWh,” she explained. According to government data, the Philippines has a vast untapped RE potential at 250,000 MW. If properly utilized, the country is set to be an RE leader in Southeast Asia. Thus, the claim that the Philippines has no choice but to generate electricity from coal cannot be farther from the truth. “Coal is coming to its end. There is no need to further invest in and develop technologies that would “clean” an obsolete and dirty energy. Any talks of alliance should be focused on decarbonization and the advancement of renewables” concludes Buenaagua. QUEZON CITY – The entire 4.8 million workers in banana, pineapple, cacao, and palm oil including those jobs in the agribusiness value chain in Mindanao are jittery over their fate in the light of on-going congressional investigation into the Agribusiness Ventures Arrangements (AVAs), according to the country’s biggest labor group the Associated Labor Unions-Trade Union Congress of the Philippines (ALU-TUCP). “We respect the congressional inquiry on the AVAs but we cannot prevent Mindanaoan workers and their families whose lives have been anchored on and around the agribusiness in Mindanao for decades to feel anxious and uncertain over the fate of their livelihood in view of the investigation,” said ALU-TUCP National President Michael Mendoza and chairman of labor coalition Nagkaisa. “We urged our lawmakers to assure Mindanaoans and guarantee that the outcome of the query of the arrangements shall not alter the existing playing field. It should not result to job losses and displacements. The investigation should not result in uncertainty among stakeholders. It should rather send a message that government is reliable social and economic partner,” Mendoza said. The statement was made amid the consultation on the on-going investigation in aid of legislation by the Committee on Agrarian Reform of the House of Representatives led by committee chairman Rep. Teddy Brawner Baguilat, Jr. at a committee hearing held in CAP Grand Auditorium in Andas, Davao City yesterday (Thursday, Nov. 23). Mendoza said ALU-TUCP supports measures that will strengthen the generation of quality jobs for all workers in the agro-food value chain and enhances the agri-entrepreneurship development and support mechanism for ARBs. “It is our view that any proposed laws on the matter should focus on developing a genuine partnership between farmer beneficiaries and the agribusiness so as to enhance the dignity of the farmers and farmworkers, and promote their agricultural security of tenure. It must retain existing investors and attract new investors as well to broaden the development in Mindanao,” he said. The Agribusiness Ventures Arrangements (AVAs) and Joint Venture Agreements (JVA) are subjects of both House Bills 5085 and 919. Authored by Baguilat, HB 5085 aims to regulate AVAs while HB 919 was introduced by the Makabayan bloc to look into the concerns raised by agrarian reform beneficiaries. The millions of workers depend on various agri-business ventures arrangements with Agrarian Reform Beneficiaries (ARBs) with agri-businesses engaged in pineapple, banana, cacao, palm oil and other fruits products in Mindanao including those workers involved in processing, packing, distribution and those jobs in the entire agro-business production value chain. The AVAs, as of March 2014 Department of Agrarian Reform (DAR) record reached a total of 161 nationwide. DAR noted that the most common AVA is contract growing/growership which accounts for 72 or 45% of the total AVAs. This was followed by lease agreement at 42 or 26%, leaseback at 21 or 13%. Joint Venture Agreements, meanwhile, is at 12 or 8%. UTRECHT, Netherlands – The National Democratic Front of the Philippines (NDFP) Reciprocal Working Committee on Social and Economic Reforms (RWC-SER) views with grave concern Pres. Rodrigo Duterte's sudden turn-about and unilateral cancellation anew of peace negotiations with the NDFP. It is the third time in six months that Pres. Duterte has obstructed the progress of the talks. His latest scuttling of the talks comes at a time when unprecedented advances have already been achieved in forging agreements on urgently needed socio-economic reforms to alleviate mass poverty and resolve the roots of the armed conflict. Just four days before Pres. Duterte cancelled the talks anew, the bilateral teams of the NDFP and the Government of the Republic of the Philippines (GRP) RWCs-SER initialed draft documents reflecting substantial agreements on agrarian reform and rural development, and on national industrialization and economic development. These were the result of a series of bilateral technical meetings by the NDFP and GRP RWCs-SER on October 26-27, November 9-11, and November 16-17. The drafts include potentially significant reforms to benefit millions of Filipinos. These include the free distribution of land to tillers, farmers, farmworkers, agricultural workers and fisherfolks. Agrarian reform beneficiaries who have not yet been able to occupy the land awarded to them will be installed immediately, including those in contested lands and agricultural estates. The scope and coverage of agrarian reform will be expanded to include plantations and large-scale commercial farms covered by leasehold, joint venture, non-land transfer schemes like stock distribution option, and other such arrangements. There are also measures to prohibit and eliminate exploitative lending and trading practices. The NDFP and GRP also agreed on the need for national industrialization and for planning to develop Filipino industrial capacity. Measures will be taken to ensure that foreign investments cease being one-sided and contribute to developing the national economy. Domestic industrialists and smaller enterprises will be protected and supported. The importance of nationalizing public utilities was affirmed. Both sides also agreed to identify key industries and priority industrial projects to jump-start industrialization. The importance of unions and workers' councils was also acknowledged. Further measures of even greater significance were set to be tackled. The GRP and NDFP RWCs-SER were optimistic that they would be able to complete the Comprehensive Agreement on Social and Economic Reforms (CASER) for signing by their respective negotiating panels and approval by their principals by January 2018. The NDFP RWC-SER regrets the unilateral cancellation of talks on such vital social and economic reforms which, if implemented, would have immediately benefited tens of millions of oppressed and exploited Filipinos. The NDFP at the same time recognizes that the people's continued daily struggles on these issues are unabated and, if anything, are made more urgent and will gain greater momentum. Pres. Duterte bears full responsibility for the failure of the talks on social and economic reforms because of his sudden turn-around and heightened hostility to the revolutionary forces and the people. TACLOBAN CITY – “Good governance is everybody’s business, not just that of local government units (LGUs), DILG or of national government. Good governance is equivalent to creating better life for the people,” emphasized Regional Director Marivel C. Sacendoncillo of the Department of the Interior and Local Government (DILG) during a press conference on Popularizing and Sustaining the Seal of Good Local Governance (SGLG) Gains on November 20, 2017 at Ironwood Hotel, Tacloban City. DILG launched the SGLG as an incentive program to encourage LGUs to embrace good governance. Twenty-six (26) of the 448 SGLG awardees nationwide are from this region, an increase from 12 in 2016 and seven (7) in 2015. Three cities in the region (Baybay, Maasin and Tacloban) passed the SGLG. 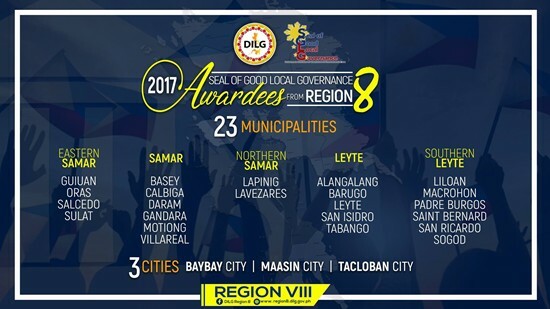 The 23 SGLG winner-municipalities are as follows: From Eastern Samar, Guiuan, Oras, Salcedo and Sulat. From Samar: Basey, Calbiga, Daram, Gandara, Motiong and Villareal. From Northern Samar the winners are Lapinig and Lavezares. From Leyte: Alang-alang, Barugo, Leyte, San Isidro and Tabango. From Southern Leyte: Liloan, Macrohon, Padre Burgos, Saint Bernard, San Ricardo and Sogod. The town of Barugo is the region’s sole three-time SGLG winner. Director Sacendoncillo lauded the LGUs for this “harvest of good governance” due to greater receptiveness among mayors of the SGLG. DILG-8 initiated a series of dialogs with LGUs and partner agencies and focused on closer mentoring to address the most challenging SGLG indicators. She sought the help of media and the public in creating a climate of good local governance by using SGLG indicators in demanding better performance from local officials. The press conference led off with an overview of the SGLG by Pia Lovete, Chief of DILG-8 Local Government Monitoring and Evaluation Division, followed by the welcome remarks of DILG RD Sacendoncillo. Present to share their insights were Mayors Ma. Rosario C. Avestruz of Barugo, Leyte; Ma. Luisa A. Menzon of Lapinig, Northern Samar; Atty. Melchor L. Melgar of Salcedo, Eastern Samar; Arnold James Ysidoro of Leyte, Leyte; Hermenigildo Culpa of Padre Burgos, Southern Leyte; as well as Atty. Irene Chiu representing Mayor Cristina G. Romualdez of Tacloban City. In attendance were representatives of ABS-CBN, ATV24, Philippine Daily Inquirer/Leyte Samar Daily Express, Tacloban City Information Office, Philippine Star/Freeman, Business Mirror/EV Mail, Kaugop RTV, IBC 6, DYVL, Magik FM, Bombo Radyo, RMN Tacloban, and San Juanico Balita. The mayors, who will receive the award in Manila on November 27, 2017, expressed gratitude to their hardworking employees and community for the SGLG award. They expressed resolve to sustain their efforts in complying with the expected new indicators in next year’s SGLG evaluation. The 2017 SGLG follows the “4+1 principle” where LGUs must pass all four Core areas: 1) Financial Administration, 2) Disaster Preparedness, 3) Social Protection, and 4) Peace and Order, which was added this year as a Core area. The areas considered Essential, which LGUs must pass at least one are: Business Friendliness and Competitiveness; Tourism, Culture and the Arts; and Environmental Protection. SGLG winners can access the Performance Challenge Fund (PCF), which may be used for projects such as disaster risk reduction and management, local economic development, potable water and construction of local water impounding stations. CAMP LUKBAN, Catbalogan City – The Philippine Army Candidate Soldier Course Class 511-2017 composed of new aspirants from Visayas, Luzon and Mindanao was officially opened on November 19, 2017 at the 8ID Jungle Base, Camp Eugenio Daza, Barangay Fatima, Hinabangan, Samar. Brig. Gen. Cesar M. Idio AFP, 8ID Assistant Division Commander, graced the Opening Ceremony as the Keynote Speaker. Also present to witness the oath-taking and reception rites were 8ID Officers, Enlisted Personnel and parents of the aspiring soldiers. 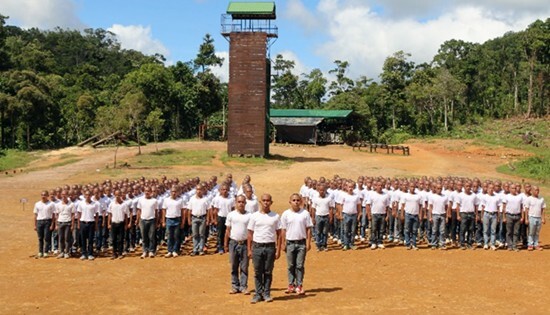 The majority of the newly selected batch of Candidate Soldiers came from Eastern Visayas region. On their educational profile, five (5) of them are board passers; 41 are college graduates; 60 are college undergraduates; and, 82 are high school graduates. They will be honed for the duration of four months in basic military training and will serve as additional soldiers that will beef-up the personnel strength of the Stormtroopers Division. Brig. Gen. Idio in his message encouraged the aspiring soldiers to learn as much as they can during the training in order to become effective and efficient soldiers. “Sa bagay na ito, kaisa ako ng inyong mga magulang na lubos na ipinagmamalaki ang bawat isa sa inyo sa desisyon ninyong tahakin ang buhay at hamon ng pagsusundalo. Sana ay huwag ninyong sayangin ang pagkakataon na ibinigay sa inyo. Marami ang naghahangad na makapasok pero kayo lamang ang iilan na pinalad na napili, ito ay pagkakataon na hindi naibibigay sa lahat kayat nararapat lamang na ito ay inyong pahalagahan,” he said to the Candidate Soldiers. QUEZON CITY – “It is us who are sick of your shenanigans, Pres. Duterte,” Datu Jerome Succor Aba, co-chairperson of Sandugo - Movement of Moro and Indigenous Peoples for Self-Determination said today in response to Pres. Rodrigo Duterte’s threats to crack down on progressive organizations such as Bayan and declare the New People’s Army (NPA) as a terror group. “Such threats only expose Pres. Duterte’s desperation to silence the growing discontent of the Filipinos. If Pres. Duterte thinks that the national minorities and the rest of the Filipino people will be intimidated to oppose his fascist and puppet government, he is gravely mistaken.” Aba said. “Declaring the NPA as a terror group will only intensify the attacks on national minorities in the Armed Forces of the Philippines counter-insurgency operations especially in far-flung communities. The possible crack down on progressive organizations will also target national minority organizations that include Sandugo. We are one of the first to declare the Duterte government a fascist regime and indicted the President for his crimes against the national minorities,” Aba said. “True enough, the fascist Pres. Duterte responds to legitimate opposition against his anti-people and pro-imperialist policies and programs by threat, intimidation and more violence,” Aba said. “We, the national minorities, have been subjected to repression and pacification for centuries. Our people in history survived massacres. We even survived the brutal attacks of the Marcos’ martial law. Many of our kin and leaders sacrificed their lives to protect our tribes and ancestral lands and territories,” Aba said. “As we speak, Lumad communities in Socsksargens are being bombed by the AFP while 10,000 have already evacuated in Maguindanao and North Cotabato due to ongoing aerial bombings,” Aba said. Sandugo calls the Duterte regime to spare more lives and put a stop on the rabid attacks on Moro and indigenous peoples’ communities. “Instead, Pres. Duterte quit his shenanigans and start to address the roots of the armed conflict and people’s discontent,” Aba concluded. 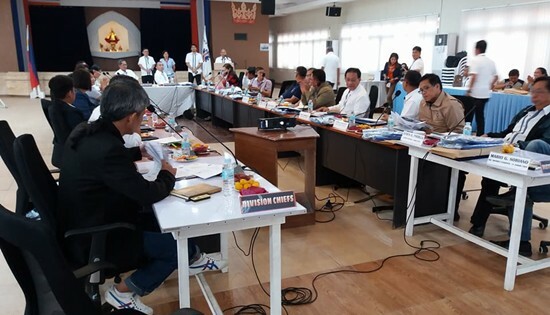 CALBAYOG CITY – District engineers from all over the region, including DPWH Samar First District Engineer Alvin A. Ignacio, attend the Regional Monthly Coordination Meeting hosted by DPWH Leyte Third on November 7, 2017 at 8:30AM in the DPWH Multi-Purpose Hall in Baras, Palo, Leyte. Regional Director Edgar B. Tabacon and Assistant Regional Director Armando G. Estrella direct the district engineers to make an action plan on the unobligated allotment in anticipation of its expiration on December 31, 2017. They further instruct them to bid out all CY 2018 Infra Projects and remaining CY 2017 projects by the same date which should include approved POWs and plans and that the last day of posting is on November 29, 2017. RD Tabacon and ARD Estrella give out orders to procure surveying instruments that will speed up the preliminary engineering activities and to improve the quality of warning signs being installed on project locations. Both also raise issues and concerns regarding the delays in the usage of PCMA. The district engineers share the various issues and concerns affecting their respective district offices. The meeting concludes with RD Tabacon’s challenge to everyone to go beyond the ordinary call of duty in order to reach this year’s targets and to strive for more in the pursuit of a higher standard of public service. MAKATI – “The Philippine economy smashed expectations to post a 6.9% growth as a robust manufacturing industry expanded by 9.4% and increased its share to GDP by 22.4% in the third quarter of 2017,” Secretary Ramon M. Lopez of the Department of Trade Industry stated. “This economic feat is creating meaningful and well-paying jobs for our people and providing a compelling environment for business to thrive. This is what the Department’s Trabaho at Negosyo thrust is all about,” the Secretary added. The growth was one of the fastest in the region, outpacing other Asian countries, such as China (6.8%), Malaysia (5.8%), and Singapore (4.6%). The services sector accounted for the highest share to GDP at 58.9%, followed by the industry sector (33.3%), and agriculture sector (7.5%). Manufacturing accounted for 69% of the total output of industry. Among the three economic sectors, industry accelerated the fastest at 7.5%, while the services and agriculture sectors grew by 7.1% and 2.5%, respectively. “We are closing in on our minimum target of growing the manufacturing industry to 25% of the country’s GDP. The Department remains relentless in our efforts to revive our factories, expand production, generate employment, and enable industry to provide the catalyst that will build the seamless link between a productive agriculture and a strong services sector,” Secretary Lopez added. Food manufactures remained the main contributor with 23.6% of total gross value added (GVA) in manufacturing, followed by the manufacture of radio, television and communication equipment and apparatus with 18.6%, and chemical and chemical products with 15.9%. Manufactures of fabricated metal products posted the fastest growth at 66.8%, followed by furniture and fixture (32.3%), and office, accounting and computing machinery (25.5%). The GVA of retail trade sector in trade and repair recorded a 6.9% increase in the third quarter of 2017. This was followed by wholesale trade (6.3%), and maintenance and repair of motor vehicles, motorcycles, personal and household goods (5.5%). Secretary Lopez added that to enable retail trade to realize its full potential as a main contributor to the economy, the Department is supporting the proposed relaxation of foreign equity restrictions, particularly setting of a lower minimum paid-up capital for retail trade enterprises (from US$2,500,000 to US$200,000). This will spur investments into the country, stimulate economic growth, and create more quality jobs for the Filipinos. Exports of goods have been growing steadily in 2017, rising by 22.8% and allowing the sector to contribute 54.0% to total GDP in Q3 2017. Electronic products, the country’s top merchandise export, increased by 24.0%, accounted for bulk of total PH export of goods at 63.4%, and contributed 34.2% to the country’s GDP. “That efforts of the Department to expand exports, increase investments are finally bearing fruit is also due largely to the private sector’s support,” Secretary Lopez noted. “It is through the concerted efforts of Government and the Private Sector that an environment conducive to manufacturing and industry development can be created,” he added. Under the Manufacturing Resurgence Program, the Department in collaboration with business and industry champions have finalized 36 industry roadmaps that will pave the way for the development of priority industries. “We are moving towards the next phase of MRP where strong linkages between large industries and MSMEs will be fostered. The challenge is to sustain the growth and trickle down the effect to smaller industries,” Secretary Lopez said. “This will entail training and upgrading the capability of our people, developing our own or adapting available technologies, and striving towards operational efficiency, to enable us to meet global demands and opportunities and enter a level of inclusive economic growth driven by innovation,” he added.